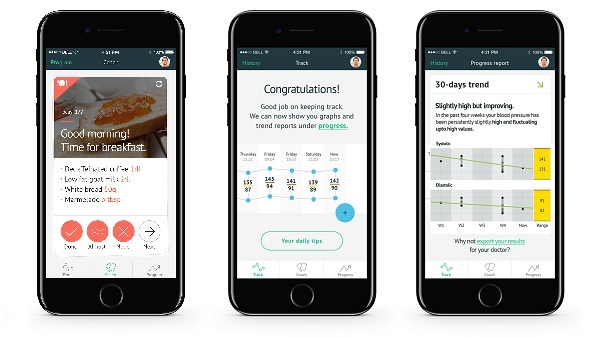 Improving lifestyle habits to help control risks related to hypertension is the goal of the partnership that Generali Welion, Generali Italy’s new company for services in the health and Welfare space, is launching with Amicomed. This partnership will allow Generali Welion to offer its customers a higly scientific and personalized digital service capable of interpreting variations in blood pressure and fighting hypertension, complementing the role of the physician and medication. This digital program, created by Amicomed in Silicon Valley, with important scientific and technical contributions from the US and Italy, combines innovative analysis of blood pressure trends and fluctuations with personalized insights on how to improve lifestyle habits to help manage blood pressure. Simple lifestyle changes, without replacing the role of a physician or medication, can help achieve important health improvements in the short and long term. The Amicomed program, which Generali Welion will offer to its customers, encourages and rewards the beneficial behaviors of its users who wish to adopt a healthier lifestyle. The service is powered by an interpretative algorithm that provides insights on blood pressure variability. This facilitates and complements the role of the physician in making informed care adjustments decisions. Users are also accompanied in their day-to-day decisions by personalized programs including daily nutritional, physical activity and blood pressure measurement recommendations. All accessible simply through their smartphone. Blood pressure values can be submitted to the service in a variety of ways: automatically through connected devices, imported from the Health App (Apple Healthkit) or even manually. According to the World Health Organization, hypertension is a chronic disease that now affects about 1 billion people(1) worldwide and is the leading cause of stroke, heart attacks and other cardiovascular events. It is often asymptomatic to the extent that it is known as a “silent killer”, killing 10 people per minute (2). People with hypertensive relatives or older than 60 years are most at risk. Key health determinants include poor daily habits such as smoking, alcohol, caffeine and salt abuse, low fruit and vegetable consumption, overweight and lack of regular exercise (3). Generali Welion is Generali’s new company for services in Health & Welfare. From health to employee benefits, it offers a world of innovative and easily available services to provide values to families, employees and companies in the field of individual health and employee welfare. Cutting-edge solutions that leverage the potential of new technologies through the development of strategic partnerships and cooperation with innovative startups. Amicomed is a digital platform that leverages proprietary algorithms to help manage people’s blood pressure. The Amicomed blood pressure interpretation algorithm is CE marked as a class IIa medical device in Europe. The platform supports physicians and patients with remote monitoring tools enhanced by unique analysis, and actionable, consumer-grade and personalized lifestyle interventions.